Justification by faith: A doctrine of Paul or Jesus? It can seem that Paul's exegesis is as if the doctrine began with him and Jesus had been silent about it, but the doctrine of the gift of justification by faith is the central message of the gospel of Christ, whether made known to Paul by direct revelation from him or by the “tradition” he says he received, certainly not limited to a few words about the kerygma. Otherwise Paul would have been the real founder of Christianity! When Jesus said, “repent and believe,” he was thus already teaching justification by faith. Before, “repent” meant “turn back,” as Hebrew shub: turn back, through renewed observance of the law, to the covenant that had been broken. “Repent” had a mainly ascetic, moral, and penitential meaning; you did it by changing your behavior. Repentance was seen as a condition for salvation, as in “repent and you'll be saved; repent and salvation will come to you.” This was the meaning of “repent,” even to John the Baptist. But when Jesus speaks of repentance, metanoia, that meaning moves to second place; it's no longer turning back to the covenant and observance of the law; it's leaping ahead, entering into a new covenant, seizing and entering the kingdom by faith. “Repent and believe” doesn't refer to successive steps but to the same action: repent, that is, believe; repent by believing! Repenting isn't so much “mending your ways” as “perceiving” something new and thinking in a new way. Valla highlighted this new meaning. If Paul takes aim at Judaism, it's because he and his audience live in that religious context. Jews possess revelation, know God’s will, and feel secure with God and judging others. The difficulty in reconciling Paul's picture of Judaism with what we know from other sources is based on an error: Jesus and Paul deal with life as people live it; scholars, with books and written testimony. Oral and written statements tell us what people want to be, not necessarily what they are. Scripture and rabbinical sources affirm grace, mercy, and God's initiative, but that doesn't mean it's in people's hearts and governs their actions. What happened at the time of the Reformation helps us understand the situation in Jesus and Paul's time. At the time of the Reformation, the doctrine taught in schools of theology wasn't disputed, Augustine’s writings were held in great honor, and The Imitation of Christ was daily reading, but what was going on in Church life was different. How to preach justification by faith today. The situation has changed since Reformation times. The issues then were primarily indulgences and how sinners are justified. Luther's main problem was overcoming guilt and finding a gracious God; ours is the opposite: restoring the sense of sin we've lost. We want all Christianity to benefit from the Reformation's important achievements once they're freed from any distortions, excesses, or abuses. A negative aspect of emphasizing justification of sinners is a focus on sin. More important than the sin Jesus removed from us is that he gave us the Spirit. Many consider Rom 3 on justification inseparable from Rom 8 on the gift of the Spirit. The Church should preach justification through faith in Christ with more vigor than ever, but not in contrast to the “works” the New Testament speaks of but to people's claim of being able to save themselves with science, technology, or an improvised, comforting spirituality, the “works” modern people rely on. If Luther returned, I think he'd preach justification like that today. For Luther justification by faith was a lived experience, only later something to theorize about; afterwards it became more a thesis to defend or oppose and less a personal, liberating experience to live out in one’s relationship with God. The 1999 declaration appropriately points out that the truths of the doctrine must take effect and be confirmed not just in Church teaching but in our lives. Paul wished to affirm not that we're justified by faith but by faith in Christ; not so much justified by grace as by the grace of Christ. Christ is the heart of the message, more than grace and faith. The Church stands or falls on the person, not a doctrine. Thank God this is happening in the Church more than commonly realized. We prefer to live unity than to talk about it. Ez 37:21-28 I'll gather Israel's children, bring them back to their land, and make them one; never again shall they defile themselves with idols and transgressions. I'll deliver and cleanse them so they may be my people and I their God. David shall be their prince; they shall live by my statutes. Forever they'll live where their fathers did. I'll make with them a covenant of peace, will multiply them, will put my sanctuary among them, and all shall know I'm the one who made Israel holy. Jer 31:10-12abcd, 13 "The Lord will guard us, as a shepherd guards his flock." The Lord shall ransom Jacob; he who scattered Israel now gathers them. They'll come streaming to the Lord’s blessings. I'll turn their mourning into joy. Jn 11:45-56 Many began to believe, but some went to the Pharisees, who said, “What are we to do? If we leave him alone, all will believe, and we'll lose our nation.” High priest Caiaphas: “It's better for you that one man die, so that the nation may not perish.” So from then on they planned to kill him, and Jesus no longer walked about in public. Many who went up to Jerusalem for Passover looked for Jesus. 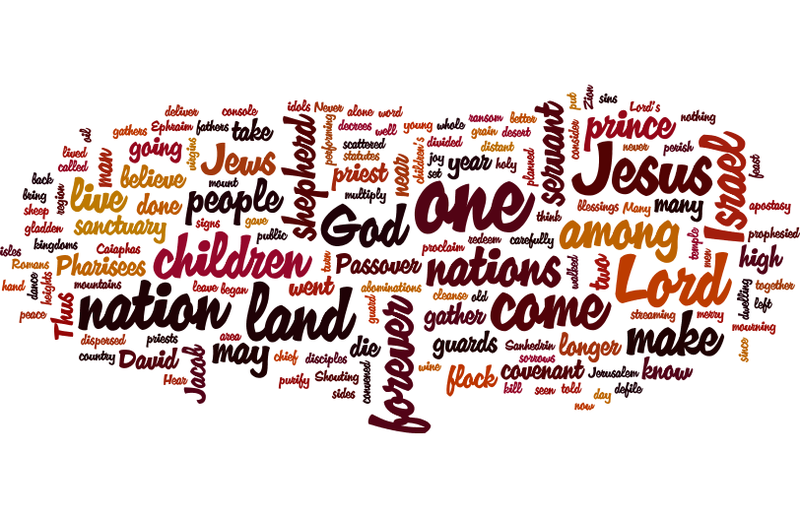 One Bread, One Body: "The magnet of unity": Jesus was crucified "to gather... the dispersed children of God." He prays that we be one as he and the Father are one. As we draw closer to Jesus, we draw closer to each other. In Holy Week we focus on Jesus on the cross; in Easter, on Jesus Risen and glorified. Jesus draws us to himself and thereby to each other. The lifted-up Jesus is the Magnet of unity. DailyScripture.net: "They took counsel how to put him to death": The Jews believed that when the high priest asked for God's counsel, God spoke through him. What irony that Caiaphas prophesied that Jesus must die for the nation. Luke adds that Jesus would gather God's children. Jesus came to lay down his life for the many, but he waited for the time when nothing would stop him from fulfilling his Father's mission. "The passion of our Lord... is the hope of glory and a lesson in patience... He loved us so much that... he suffered for us sinners the punishment we deserved. How can the Source of righteousness not give us the reward we deserve for our righteousness? How can he not reward the saints when he, sinless, bore the punishment of sinners? Let us acknowledge and proclaim in joy and glory that Christ was crucified for us" (Augustine). The way to glory and victory is through the Cross. 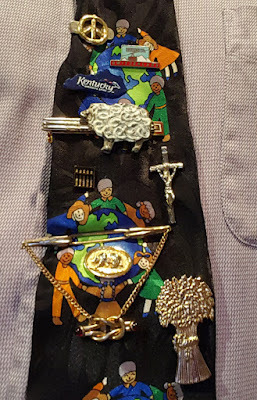 'Abacus' tie pin: I'll 'multiply' them (1st reading); 'division' between Sanhedrin and Jesus (gospel); how to do both.